Home » IoT » What is an aggregator? Just as the Star Wars trilogy of trilogies started in the middle and then went to the past followed with the future, I’ve decided to discuss the three IoT systems starting in the middle and then move to the other two. My problem is determining whether to go to the cloud or to the smart sensors next. But, putting that aside, let me give my definition of an aggregator. At first glance, it appears to be the unnecessary component in the IoT. It seems to look like the cloud to the smart sensor and look like a smart sensor to the cloud. But, if that is the conclusion you came to, you are well on the way to understanding its value as one of the components in the IoT. The simple way to look at IoT is to assume we have a cloud (I’ll later talk about whether the concept of the cloud is singular or plural) to which smart electronic devices connect directly. In that sense, perhaps the concept of a smart sensor and an aggregator are variations of the same device. But that concept doesn’t work well in every IoT opportunity. Communicates with the cloud using standard communication methods. It has enough processing performance to service multiple smart sensors. In doing so it manages the raw data from the multitude of smart sensors, digests their data, prepares a set of information ready to transmit to the cloud and then transmits the data to the cloud. In some cases, the aggregator has enough autonomy to act as the cloud for the system it is in. In later discussions I will go further into detail on the characteristics of the Cloud and Smart Sensor. But for now let me focus a bit on the Aggregator. The aggregator is the communications link between the multitude of smart sensors and the cloud. The best example of an aggregator is the smart phone. It has reasonable battery life, cost, and performance. We see many devices that can either be physically attached to the smart phone or can be connected to it wirelessly or with wires. It generally executes all of the necessary functions for it to be useful. But it always has the option of seamlessly involving the performance of the cloud. Its downfall is its battery life. For it to perform at its full potential it needs to be powered or limit its usefulness to relatively short duration activities. This leads to a broader aspect of the aggregator. It needs to be the continuously powered interface between the many smart sensors, which are not externally powered, and the cloud, with its infinite performance. We can find other examples of aggregators in industrial controls and medically implanted appliances. I would also be remiss in not including products like Beaglebone Black, Raspberry Pi and Arduino. In each of these examples there are common traits: a microcomputer or microprocessor, many standard real world interfaces and a variety of communications options. Their performance is adequate to meet the needs of the system they are in and their power requirements are low enough to allow a reasonable amount of battery life or to be powered using the power from a USB connection. 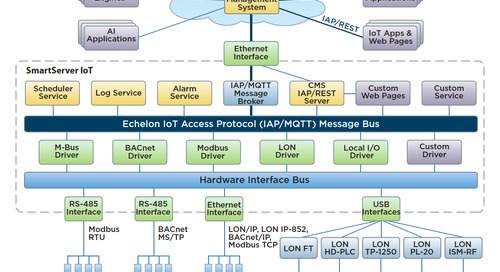 Hopefully now you can see why starting in the middle of the IoT system sets the stage for the rest of the systems. And, just as in the Star Wars Trilogy of Trilogies, the middle trilogy (the aggregator in my case) is obviously the most interesting of the three. Which was your favorite Star Wars trilogy? What was your favorite episode? In the table I use terms like “high”, “medium”, and “low”. What are your working definition of these three terms when it comes to performance, cost and power dissipation? I used a fourth term called “ultra-low”. How does it fit in relationship with the other three terms from question 1?